Without sounding like a complete scrooge, I’ve never been the biggest fan of Christmas baking. My Granny would always serve a traditional homemade pudding on Christmas day, within the fruity, rich folds of which there would be hidden a well-worn thrupenny bit. With a market value of a pound for whichever lucky person discovered it in their slice (hopefully without breaking any teeth), it was the subject of much excitement amongst the children of our family, but never enough to convince me to accept a whole slice of this strange, slightly stodgy dessert. Later in the day, the Christmas cake would come out. Still full from lunch and far more excited about the chocolate coins at the bottom of my stocking, I’d generally pass on eating any, unless hovering at my dad’s shoulder to sneak some scraps of icing (taking care to remove the marzipan layer, another festive food I’ve always been shamefully fussy about). Mince pies were a slightly different matter. I love the sweet, buttery crust and enjoy making my own, filling the little pockets of pastry with spoons of sticky mincemeat, baking them til crisp then showering in a snowfall of icing sugar. But if I’m completely honest, they’re not my favourite thing and more a vehicle for eating extra quantities of cream or brandy butter (my top trick being to remove the lid, fill the pie with your creamy accompaniment of choice, then sandwich the whole thing back together). This is a post is for anyone who (shhh) doesn’t really like Christmas baking. For those of you who can’t quite face the thought of pudding followed by fruit cake followed by mincemeat-filled pie. For people who (dare I say it?) may have found themselves wondering if it might just be better to have something chocolaty on Christmas day. That’s not to say that if you’re a fan of Christmas baking you won’t like this recipe. I’m pretty sure you will. There’s plenty of wintry flavour in the form of spicy cinnamon, soft sweet pears and toasted nuts. 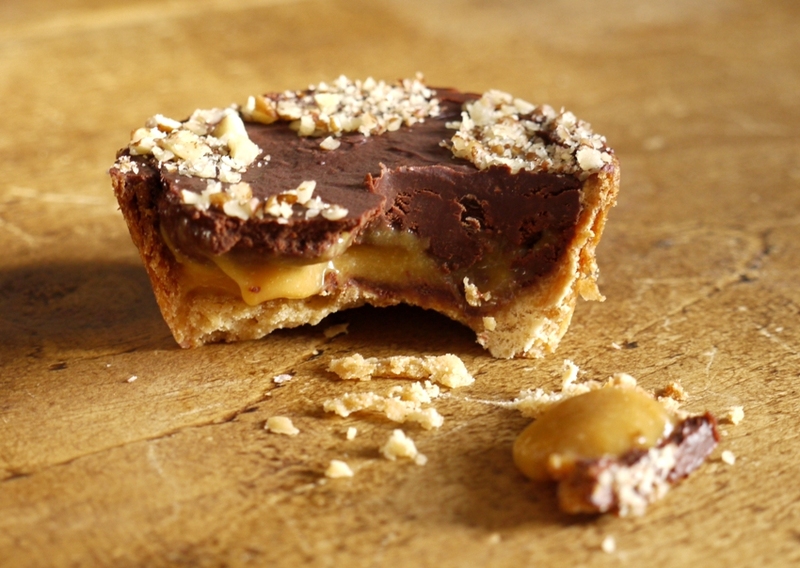 There’s flaky pastry and creamy caramel, smooth chocolate ganache and crunchy toasted pecans. Did I mention that the caramel is made with pears? I was saving the best til last: pear caramel is divine. This year I’m making my family a flourless chocolate and cranberry cake on Christmas Day. We eat late enough now that Christmas cake isn’t really called for in the afternoon, but come early evening, when presents are opened, party hats on and we’re starting to feel just the tiniest bit peckish, I have a feeling that a plate of these little pies might just make an appearance. The recipe below will make more pear caramel than you need to fill the pies but I promise this isn’t a bad thing. Pour it over vanilla ice cream or simply spoon it out the jar in sticky fingerfuls. It is almost Christmas, after all. Beat the butter and sugar at a low speed in a stand mixer with the paddle attachment until just smooth, about one minute. Add the egg yolk and mix for 30 seconds, then add the flour, cinnamon and salt, mixing until the dough just comes together. Divide the dough into eight equal pieces and press directly into the holes of a deep muffin tin, pressing gently with your fingers so that the pastry is of an even thickness on the bottom and sides. Prick the bases of each tartlet with a fork then pop the tray in the freezer for one hour. Preheat the oven to 190 degrees C. Remove the tart cases from the freezer and bake for 7 minutes. Remove from the oven, press flat any dough that has risen away from the edges then return to the oven and bake for a further fifteen minutes or until golden brown. In a large, heavy bottomed saucepan, heat the sugar until it begins to melt at the edges. Using a heatproof spatula, carefully stir the caramelised edges into the middle until all the sugar is dissolved. Add the chopped pears. The caramel will seize and harden but don’t worry: as you continue to heat the mixture it will return to its liquid state. Cook the mixture for ten minutes over a medium heat, until the pears are soft and mushy. Using a potato masher, squash the pears and caramel together to form a rough, mushy, thick liquid. Cook for one minute more then remove from the heat and add the double cream and salt. Blitz the whole lot in a blender, taking care to seal it tight as the caramel will still be pretty hot! Transfer the caramel to a bowl and allow to cool at room temperature, then store in the fridge until needed. In a small saucepan, heat the cream until just beginning to bubble. Remove from the heat and pour over the chopped chocolate, allowing to stand for about 45 seconds. Stir the cream and chocolate until combined in a smooth ganache. 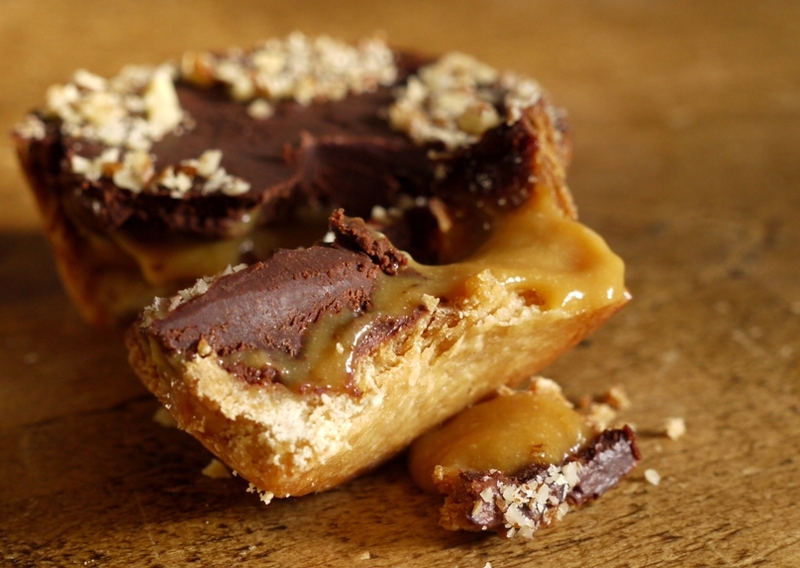 Spoon 1 – 2 teaspoons of caramel into the base of each pastry case. Divide the ganache between the eight pies, pouring over the caramel layer and smoothing the top with a palette knife. Place a star shaped cutter over the top of one pie and sprinkle chopped nuts in the middle to create a star. Alternatively, leave the middle empty and scatter the nuts around the edge of the star for a reverse effect. Put the pies in the fridge to set. If you like your caramel soft and runny, allow to come to room temperature before serving. If you like something a little more solid, eat straight from the fridge. Though I am a diehard traditional mincemeat/mince pie fan, I guess I could admit that these do look good. Maybe. Great to see that you worked out the pear caramel! They look wonderful and good for any time of year! Interesting… sounds delicious, but I am also a die hard mince pie fan! My Gran used to make around 8 xmas puddings every year, but she died in April so someone else will have to make them – they take 8 hours each! I’m not a fan of xmas cake though! OMG these look soooo good. I absolutely have to try baking these, especially as I am not a mince pie fan either. I made these with raspberries instead of pears and they turned out brilliantly. I’ve blogged about them here http://wp.me/p26VQG-qm with links to your site. Hope that’s ok? Thanks so much for sharing this fabulous recipe. They look absolutely delicious – great adaptation! I’m with you, I’ve never been a fan of any of that traditional christmas baking. My contribution to christmas this year is, like you, going to involve plenty of chocolate instead. Love the idea of these mince pies – such lovely flavours in a perfect bite and *so* much better than normal mince pies. That last picture of chocolatey goodness with caramel oozing through had me (althought I didn’t really need convincing since I am not a real fan of Christmas baking be it in any form or nationality – from Christmas pudding to panettone to Stollen -Shhhh!). I’ve never felt compelled to stick with traditional Christmas fare; maybe it’s an Australian thing. I love the idea of a pear caramel. I will definitely try it! Nice! These look amazing. Mincemeat should be banned! I LOVE mince pies, Christmas cake (minus the icing) and Christmas pudfing. I make Christmas pudding ice cream with the leftovers which is divine. Having said all that, these little pies sound like a great invention and may be added to the list. A little sweet? Or does the pear cut through the sweetness a bit? Emma – the pear caramel is sooo yummy. 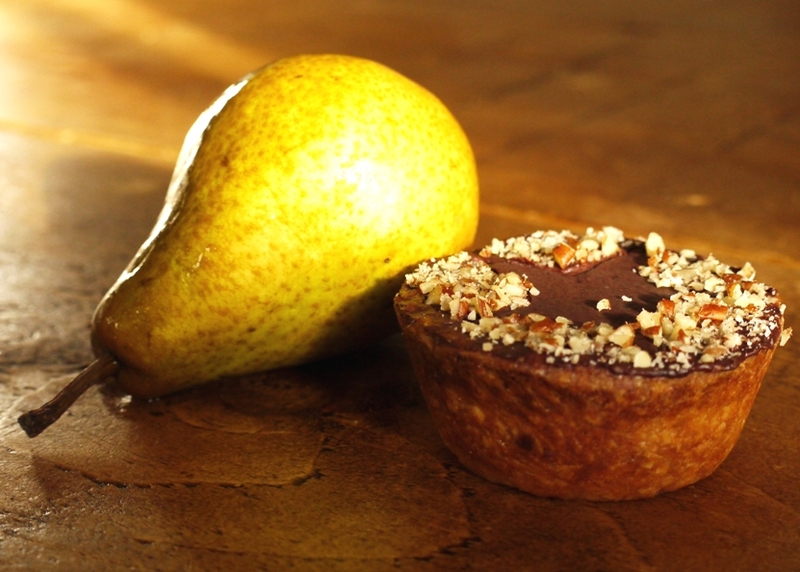 I couldn’t get it to set perfectly because of all the liquid in the pear, but I quite like how it oozes out of the tarts. The Single Gourmet & Traveller – absolutely! Under the Blue Gum Tree – enjoy! Nuts About Food – your secret’s safe with me! Stephanie – I can imagine all that dried fruit is a bit much in the Australian heat – these would definitely be better! Kerry – haha, not sure I’d go that far but I know how you feel. Lucy – they are quite sweet but as long as you use dark chocolate the ganache is actually a little bitter and works wonderfully to cut through the sweet caramel. These look seriously good! Do you think the caramel would work as well with bananas instead of pear (I’m not the biggest fan of pear in desserts). Totally with you on the traditional Christmas desserts – I’d take something chocolaty every time given the choice! ohh turning pears into caramel – genius! We never had plum pudding, fruit cake or those other traditional things so Christmas baking to me is simply tasty, spiced treats, this would fit in perfectly! I couldn’t agree more – I don’t like anything that is considered traditional christmas baking (unless you include gingerbread – I love that!). After reading your comment on my blog I thought it only fair that I should come along and try to persuade you of the joys of Christmas baking! Much as I am a die hard lover of all things chocolate, it is this fruity spicy rich and decadent baking that I love to make from now until Christmas. I used to be of the same opinion as you but then I made Delia’s Creole Xmas cake and I was persuaded otherwise. I suppose what I am saying is that it’s always worth trying out a variety of recipes until eventually you will stumble across something that changes your mind. I have only become a recent convert to Xmas baking. Maybe you just grow into it, who knows. Maybe one day! I wish I hadn’t read that line about the mincepie-cream-sandwich I’m going to put on at least half a stone from that idea this season!!! these pies look perfect for my spiced dried fruit hating in laws! I didn’t like mince pies at all until a few years ago but now I can’t get enough of them. I’d happily give one up for one of your pies. I’m still not a fan of Christmas pudding or Christmas cake – the only thing I like on that is the marzipan. Everything about this is amazing! So much better than my alternative mince pies! Cheeniroti – ooh yes, like banoffee pie with ganache – think that would be delicious! JJ – you have to try the pear caramel, it’s so good. The Caked Crusader – LOVE gingerbread. Laura – I think you might be right – one day I could well be a full-on Christmas baking fan! 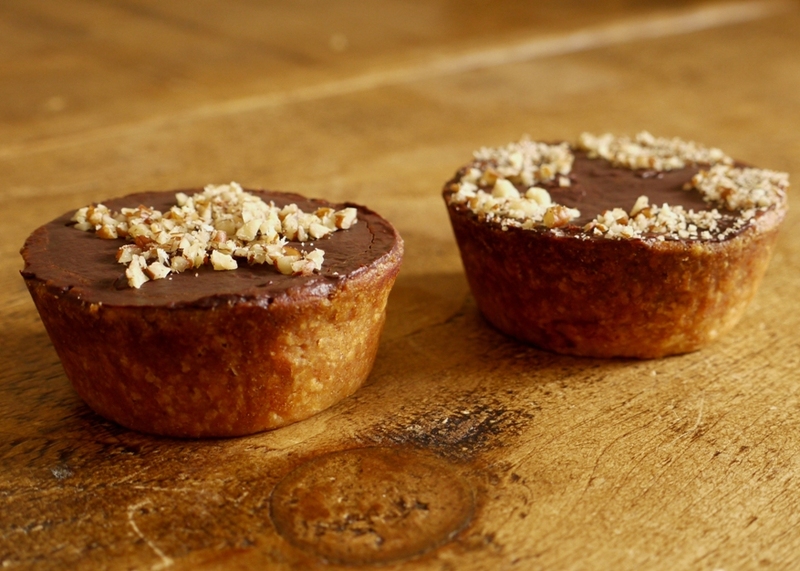 Laura – ooh, not sure about marzipan…but mince pies are definitely growing on me. Elly – ahh, thank you! So pleased you like them. I”m so glad that ‘mincemeat’ is now mostly a melange of fruits instead of meat and fruits. I used to steer clear of it as a kid, convinced it was loaded with sugar and meat lol I love that you turned into something like a billion times tastier and mouth-watering with pears, caramel and chocolate ganache. You are amazing! No mince pie for me, thank you very much. So, may I have extras of these? These look beyond heavenly! Want to bake for a dinner party this Saturday night. Can I make them the night before and store in fridge? Will they still be ok? Thanks so much. Yes, absolutely – they should keep fine for a couple of days. Enjoy! Oh my goodness, these look wonderful! I must admit I’m very partial to Christmas baking, partly from the smells that a steaming pud fills the house with. But these will have to join the traditional Christmas sweet treats in our house. Lisa – haha I think a lot of people are confused by the name! Emiko – here’s hoping you can try them soon! Karen – I think there’s room for two pies in everyone’s life. Laura – everyone needs a little chocolate in their life at Christmas. What a nice twist on a classic. I love fruit caramels! Sacha – thank you. The pear caramel is a revelation – took me a couple of tries to crack it but the recipe I’ve ended up with is yummy. Now this is my type of Christmas pie. 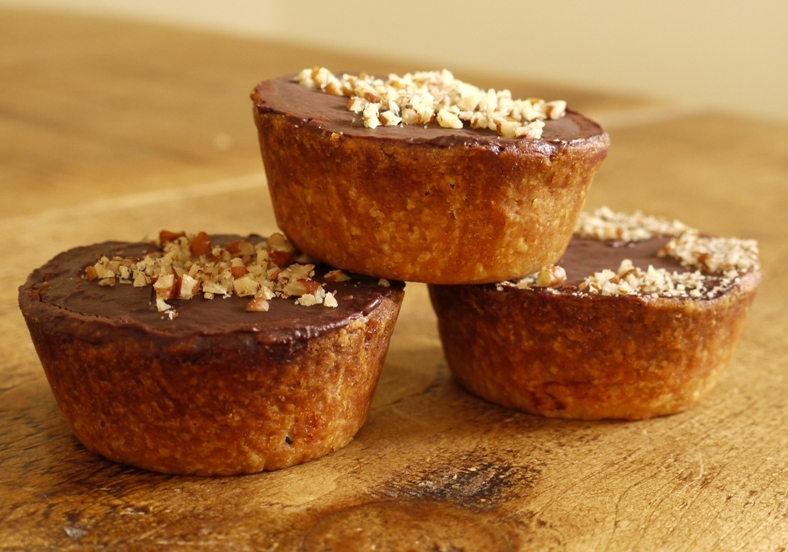 I can’t stand mince pies, and well, these, are right up my alley. And that pear caramel is to die for. I’m going to have to try this! Those are not an alternative to mince pies, they are a decedent dessert. But what a dessert, it’s one I wouldn’t say no to. They look so attractive with the different colour layers. I’m now desperate to get my hands on some nice ripe pears so I can make pear caramel. Jennifer – you HAVE to try the pear caramel, it’s heavenly. while I do consider myself a bit of die hard christmas baking fan and have eaten on average 3.6 mince pies each day since Sept these look so fabulous and indeed very festive! Love ’em! in the method for the pastry you forgot to mention the cinnamon. I LOVE this recipe – made them just before Christmas for my hubby’s work and they went down a treat (although I didn’t have any pears so just made a salted caramel instead!) I’m hoping to make them again this week only on a larger scale – for around 75 people. Was wondering if you had any suggestions on how I could serve them up? It’s a banquet style event so trying to think of a way of presenting them/things that might go well with them on a plate? I love a mince pie, as soon as I see a box in the shops, even if we are barely out of September I snap one up. Now I know…Shop bought but the thing is I do make 2 Christmas cakes every year and after the success of a home-made Christmas pud last year, I’ve been asked to make 2 this year! as well as home-made mince pies but just the thought of making mince pies fills me with dread…well not dread exactly.. but oh god not more raisins, sultanas, cherries and currents kinda thing! So I am so glad I came across your alternative mince recipe as it will give me a break from all the raisins whilst still filling the demands of home-made mince pies. Looking forward to making them. Yes, you should be good to freeze them. Enjoy!